Megan Kealy and Jack Leahy are European champions after claiming gold in Azerbaijan. The duo from MK Gymnastics were part of successful GB teams to take gold medals, while Megan added a silver to her collection in the individual senior finals. 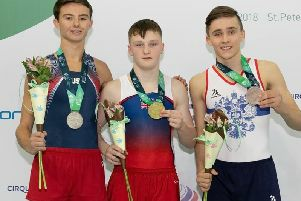 Having narrowly missed out on qualifying for the indiviual finals, Jack and fellow GB teammates Jaydon Paddock (City Of Birmingham), William Cowen (Pinewood) and William Finn (Wakefield GC) proved that they were an unstoppable force with a combined score of 107.800 and brought the title home to Great Britain. Megan, performing in her first international senior competition, scored 68.400 to finish just behind reigning champion Anna Korobeinikova. Before her final though, she was in action for the GB team, and with Lucie Colebeck (Pinewood), Shanice Davidson (Durham GC), and Rachel Davies (Durham GC) GB retained their senior teams crown. Megan’s individual final followed though, and delivering jumps of 34.700 and 34.800 for a total of 69.500 left her in the silver medal position behind fellow GB team-mate Coleback. “I couldn’t be prouder of what Megan and Jack have achieved this week at the European Championships," said Mikey French, MK Gymnastics coach. "They have shown grit and determination and not only that they have proven that they are truly team players and willing to put it all on the line for their teammates and country. "Everyone at the club is proud of what they have achieved and would like to congratulate them once again on their phenomenal performance”.